Everyone's hearts broke in February when news veteran Tom Brokaw revealed that he was fighting cancer, but the good news is that Brokaw is upbeat about his progress. On "The Late Show with David Letterman" Thursday night, the former NBC News anchor said that he's been "very pleased" with the way his treatment is going, although he didn't want to say much more than that. "As you know, I was keeping it as private as I possibly could, which I intend to continue doing," Brokaw said. "I'm very pleased with the progress, and that's about as far as I want to go." The 74-year-old was diagnosed with multiple myeloma, a cancer affecting blood cells in the bone marrow, in August. When the news came to light, Brokaw said he was "very optimistic" about the future and the "work and adventures still to come." 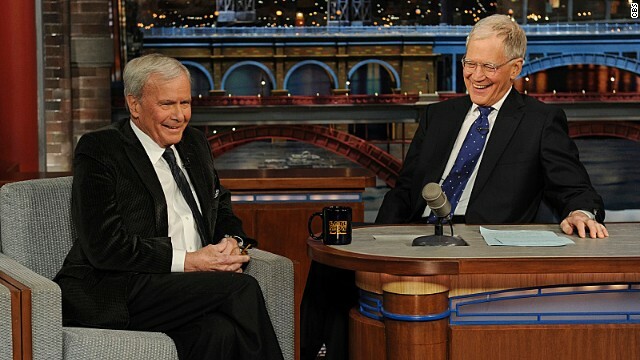 While his preference is not to dwell on his diagnosis, Brokaw did want to make an eloquent point on "Letterman" about how his stature has impacted his treatment and outlook. "A lot of people are going through what I'm going through, and they don't have the advantages that I do. I am so conscious of that, every day," he said. "It involves the whole family and it's tricky and it becomes a big strain. In our case, we've got the resources and the access and I've got this fabulous family. So I am much more aware of what other people are going through, and I think we all have to be."